The People’s Book Prize has announced the 36 finalists in three categories – fiction, non-fiction and children’s – for its annual awards. Public voting will take place in April for the winners, who will be announced on 8 May at the People’s Book Prize dinner at Stationers’ Hall. The evening will also see the presentation of the Beryl Bainbridge Award for First time Author, the People’s Book Prize for Best Publisher, and the People’s Book Prize for Best Achievement. The 36 finalists for the People’s Book Prize 2019 have been announced. They will compete again from 1 to 30 April when the public will vote to determine the overall winners. Votes are carried forward and those who voted before can re-vote for that book. The People’s Book Prize for Fiction, for Non-Fiction and for Children’s. The Beryl Bainbridge Award for First time Author. The People’s Book Prize for Best Publisher. The People’s Book Prize for Best Achievement. AWARDS CEREMONY: At the historic Stationers’ Hall 8 May 2019 when winners are announced. Rewarding talent voted exclusively by the public: 6 Awards: Fiction, Non-Fiction, Children’s, Best Achievement, Best Publisher and The Beryl Bainbridge First-Time Author Award. Covering the full spectrum of news in publishing. Innovators. We love you! The Winter Collection is now showcased with a superb choice of books and authors in Fiction, Non Fiction and Children’s. Do visit, read, comment and vote. YOU decide the next Best Sellers. The Finalists and entries of the Summer Collection are also featured. Whilst voting is no longer open YOU can still make comments and buy the books. The Finalists of the Summer Collection are announced. Whilst voting is no longer open the public can still make comments and buy the books featured in the Summer Collection. The Winter collection starts on 1st November. in recognition of Christina’s contribution. Her book ‘Share Some Secrets’ is now getting international recognition. Orders from Norway, Australia and Singapore. There is nothing like this book in the market http://www.archive.peoplesbookprize.com/book.php?id=1270 Picture rhyming book addressing sexual abuse encouraging children to think about the secrets they should and shouldn’t keep. Well done, Christina! A worthy winner. As reported by BookBrunch below, today we feature our new SUMMER Collection that can be voted for by the public until 15 October 2018 – Schedule below. As we deferred the 2017 Awards, on 8 May 2019 The People’s Book Prize will name 2 winners per Award at the prestigious Awards Ceremony at Stationers’ Hall. www.peoplesbookprize.com actively supports the eradication of illiteracy and remains the book prize wholly voted for by the public who choose the Next Best Sellers. The prize is relaunching on 1st June 2018, with a new website and a structure that involves two collections a year, rather than the previous four. Winning books from the summer and winter collections go forward to compete for the annual awards, decided by public vote and presented at Stationers’ Hall. The 2018 People’s Book Prize ceremony takes place on 8 May 2019. The prize patron is Frederick Forsyth CBE, who succeeded the late Beryl Bainbridge DBE. 7 Winners emerged triumphant at Stationers’ Hall in London with Patron Frederick Forsyth, CBE, presiding. Founder Tatiana Wilson spoke of the prize’s ‘uniqueness and democracy’ in the way it gives small publishers recognition and is voted on by the public – stories like this help bring to the attention of the world how important literacy and the eradication of illiteracy are. Fiction The Grotto’s Secret, Paula Wynne (Prado Press) A thriller set in modern day London with a medieval time lapse twist in Spain. Non-fiction A Life in Death, Richard Venables and Chris Hollington (Thistle) A Detective Inspector’s personal account of working in victim identification. Children’s The Wolf is Not Invited, Avril McDonald (Crown House) A picture book for 4 to 7 year-olds designed to help children with self-confidence. Rent Unmasked, Fred Harrison (Shepherd-Walwyn) – a non fiction work on economics and contemporary policy-making that if implemented could bring world prosperity. The Beryl Bainbridge First Time Author Award Library Cat, Alex Howard (Black & White) Howard’s debut started as a popular Facebook page he created as a student, which was from the point of view of his university’s ‘Library Cat’. Best Publisher Hammersmith Books – Founder Georgina Bentliff Small traditional publisher of health books with a win-win formula for their titles/authors. Fantastic evening at the 7th Awards Ceremony. Patron Frederick Forsyth presided. SKY NEWS has on camera! Best Achievement: Sustainable Medicine by Dr. Sarah Myhill (Hammersmith Books), Best Publisher: Percy Publishing; The People’s Book Prize Fiction: The Road to Donetsk by Diane Chandler (Blackbird Digital Books), Non Fiction: Finding the Rainbow, Rachel McGrath (Pegasus) and Children’s: Milky Moments by Ellie Stoneley (Pinter & Martin). The SUMMER 2015 Fiction, Non Fiction and Children’s collections continue to be voted for until 31st August. The new Autumn Collection will start on 1st September and titles can be bought and/or borrowed from the local libraries, commented on and voted for until 30th November 2015. Have fun and enjoy the lovely books featured. And remember YOU are the Jury! Help choose the next bestsellers! The summer collection has some fabulous titles in fiction, non-fiction and children’s. There is a lot of interest and the public are buying, commenting and voting for their favourites. Carry on spreading the word! You are the Jury. Have a wonderful summer! The 6th Awards Ceremony of The People’s Book Prize black tie dinner at Stationers’ Hall. Broadcast ‘live’ by SKY NEWS the glamorous event celebrates the finalist and winners chosen by the public. Publishers are invited to submit their Free Entries for The People’s Book Prize Summer 2015/16 collection which starts TPBP 7th year on 1 June 2015. 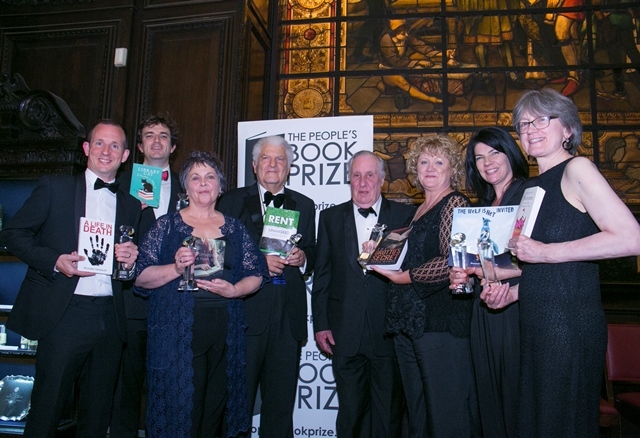 The Winners of The People’s Book Prize 2014/15 are announced at TPBP 6th Awards Ceremony on 27th May 2015 at Stationers’ Hall www.stationers.org. The black-tie ceremony will be broadcast ‘live’ by SKY NEWS. The current Patron is Frederick Forsyth. Eggheads the prestigious quiz programme – Enthralling! We now have the Summer 2014 Finalist shortlist. The new Autumn 2014 collection can now be voted for until 30 November 2014. Discover some superb titles and authors – borrow the book from your library or buy it from the links provided and then vote! You! Be the Judge! Five winners emerged triumphant at The 5th Awards Ceremony of The People’s Book Prize black tie dinner at Stationers’ Hall. It was the ideal event to recognise the public’s choice for their favourite books. From L to R: RJJ Hall (Fction – Theatres of War), Helen J. Bate (Best Achievement) – Proverbs & Sayings) Margaret Skea (The Beryl Bainbridge First Time Author – Turn of the Tide); Danny Bent (Non Fiction – You’ve Gone too Far This Time Sir) and Billy Bob Buttons – I Think I Murdered Miss). The public have chosen Britain’s next bestsellers: A thrilled Billy Bob Buttons (Children’s Winner) said: over 40,000 copies have been sold so far! The public have chosen and Five New Winners were announced at the fifth Awards Ceremony of The People’s Book Prize. We look forward to our sixth year which starts on 1st June with the Summer entries. These can be voted for until 31st August. Grateful thanks to the public and our thousands of followers, publishers, authors and media. The Spring 2014 is now being showcased and can be voted for until 20th May 2014. The People’s Book Prize 2013/14 Fiction, Non-fiction and Children’s literature. The People’s Book Prize Best Achievement Award for outstanding content for the author whose writing has led, or could lead to benefitting the community. New pages for the public to vote for the finalists will go live in www.peoplesbookprize.com on 21 May 2014. Votes already received by the author/title are carried forward. Just to bring you up to speed. Publishers are submitting their entries for our Spring 2014 collection which starts on 1 March. The public are actively voting for the entries in the Winter 2014 collection until 28th February when 9 more finalists will join the existing 18 from the Summer and Autumn collections. Please keep voting and inviting your friends/colleagues/relatives to join our thousands of followers. Exciting new titles are now showcased in The People’s Book Prize Winter 2013 collection which is now being voted for until 28 February 2014. The public has now voted for a further 9 Finalists (Autumn 2013 collection) so we are half way through to finding the Winners of The People’s Book Fiction, Non-Fiction, Children’s, Best Achievement & The Beryl Bainbridge First time Author Award. These will be announced at our prestigious and elegant black tie 5th Awards Ceremony at Stationers Hall, Ave Maria Lane, near St. Paul’s Cathedral on 28th May 2013. Our website offers a unique collection of books to choose from (current and past collections) that can be bought as gifts all year round and especially now during this Holiday Season. Why not make a New Year’s Resolution to spread the word in 2014? Talk to your friends/colleagues/relatives and aim to get three new people to register at, www.peoplesbookprize.com? Thanks from the Team at The People’s Book Prize and from us all best wishes for health, prosperity, happiness and peace now and in 2014. The public has now voted for The People’s Book Prize 9 Finalists Summer 2013 collection. The People’s Book Prize Autumn 2013 collection is now being voted for until 30th November 2013. Some exciting titles and authors. THE PEOPLE’S BOOK PRIZE GETS THE NATION READING! The charity Read & Grow has joined forces with The People’s Book Prize to donate the unique 121 reading tool Yes We Can Read, to a number of prison libraries. The ease of delivery of Yes We Can Read and its ‘each one teach one’ philosophy enables anyone who can read fluently to teach a non or poor reader within 6 months or less. No training is required. Using the ethos ‘for the prisoner by the prisoner’ it is hoped that inmates will pick up Yes We Can Read in the prison libraries and teach fellow inmates to read. At present over half the prison population has poor or no reading skills. Prisons benefiting from this pilot scheme are HMP Holloway, Ford, Aberdeen, Maghaberry, Brixton, Parkhurst, Kingston, Dorchester and Aylesbury YOP. Tatiana Wilson is the founder of The People’s Book Prize. She came up with the idea of an online and democratic prize after being frustrated that new authors and publishers were not being given equal opportunity in the marketplace, based purely on talent and ability. It is Tatiana’s ambition to use the People’s Book Prize to help eradicate illiteracy, which she calls the intellectual cancer, so was delighted when Yes We Can Read, a self help reading book, was voted for by the public in 2011.www.peoplesbookprize.com is the perfect place to discover new and undiscovered books, raise the profile of libraries and celebrate reading. Tony Humphreys is Managing Director of Talent Television, a television production company which produces a wide range of entertainment and factual programmes for both UK and international broadcasters. Talent has a strong track record in interactive programmes leading the way in the UK as the producer of BBC1’s ‘Test the Nation’ series. Tony Humphreys, is also CEO of the prestigious annual art exhibition and competition Discerning Eye sponsored by ING. The People’s Book Prize is the democratic Book Prize voted exclusively by the public aimed at finding, supporting and promoting new and undiscovered works. It is the public who choose Britain’s Next Bestsellers. Supported by Patron Frederick Forsyth CBE the Award consists of prizes in three genres – fiction, non-fiction and children’s literature. Leading up to the ceremony titles are showcased onwww.peoplesbookprize.com and the books which receive the most votes go forward as finalists with three authors emerging as winners. In addition, The Beryl Bainbridge Award for First Time Author is given in honour of TPBP founding patron and an award for Best Achievement for outstanding content to the author whose writing has led, or could lead to benefitting the community.